Mrs. Parris had been dead for years and the family consisted of Betty, Mr. Parris, Abigail, and Tituba. Betty was present for the trials. Mr. Parris claimed to be a graduate of Harvard. 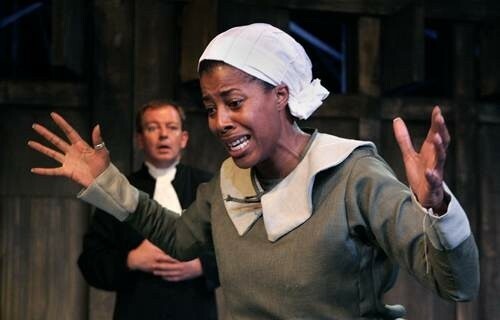 Tituba was single and didn’t have family as a slave. Tituba confessed quickly. After the trials began Betty was sent away. Mr. Parris actually went to Harvard, but dropped out. Tituba was actually an Indian woman who had a husband named John and a daughter named Violet. She was also tortured for a long time before she confessed. John Proctor is young and is a farmer. Elizabeth is his only wife. John Proctor only has two young sons. John is actually 60 and a tavern keeper. Elizabeth is his third wife. John has a daughter that is 15, a son that is 17, and another son that is 33 from a previous marriage. The adultery between Abigail and John is unlikely to occur as they lived far from each other and Abigail never worked for them. The events of the crucible are tragic, and many argue could have been prevented. Who do you feel is most responsible for the hysteria that causes the tragic events if the crucible.